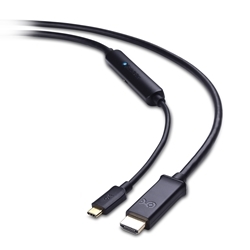 The Cable Matters USB-C to 4K HDMI Cable with 60W Power Delivery connects a thin laptop with a USB-C or Thunderbolt 3 port to a display with HDMI. Simultaneously power and charge a laptop up to 60 watts and view video on a 4K LED monitor for an extended workspace. Supports video resolutions up to 3840x2160 @ 60Hz with backwards compatibility to HD 1080 and 720. Mirror 4K content from your Samsung Galaxy S8 to a UHD TV while charging your phone. Simply connect your the HDMI cable and the USB-C charger that came with the phone. This adapter is compatible with smartphones such as the Samsung Galaxy S8, S9, Note 8, HTC10 and HTCU11 that support video over USB-C.
Thunderbolt 3 equipped Windows and Mac computers use a USB-C port to connect Thunderbolt 3 compatible equipment. Power and charge a laptop or smartphone up to 60 watts with a power delivery equipped port USB-C and your USB-C charging cable.